New to WINiT? Or a Community participant? WINiT Contributors have access to WINiT 1:1 Mentoring. Join/Upgrade as a Contributor to enroll. Are you a WINiT Contributor? Learn more about the program and enroll today. WINiT 1:1 Mentoring is a self-service program for Mentors and Mentees across all categories and locations in the travel, meeting, event and exhibition industries and is open to women and men. Both Mentors and Mentees can ‘hand pick’ their selection based on a quick match questionnaire. Participants of WINiT at the Contributor level will have exclusive access to WINiT 1:1 Mentoring. 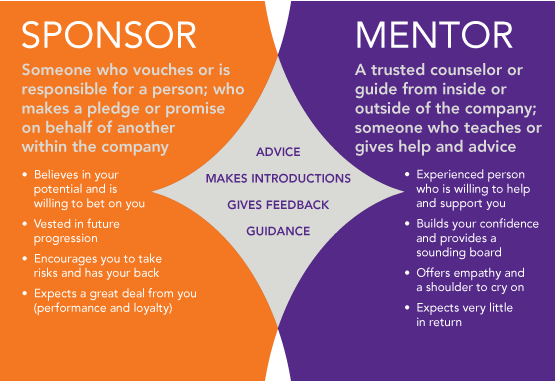 Why Have a Sponsor and a Mentor? have a mentor and sponsor for optimum professional growth. "I had the pleasure of working with 2 Mentees as a WINiT Mentor, Beth Quinn, CMP, CTE, GTP Travel & Events - FLIR Systems, Inc. & Ann Meskill, Independent Travel Director, Incentives, Meetings & Events. This experience was so rewarding for me, I know I learned as much as I shared while expanding my education & business travel network!" "I have had the pleasure to be working with Africa Hernandez with Carlson Wagonlit Travel for the last few months. It has been rewarding to help provide some solid feedback on her career to date and some new ideas for opportunities she may not have been thinking about exploring until we began our mentor/mentee relationship. We also focused on communication skills, specifically reviewing her goals and how to present and communicate them to her leaders." "I thoroughly enjoyed the time spent with my mentor, Pam McTeer, in the WINiT Pilot Mentor Program. She shared with me insightful, thoughtful and useful advice on the topic of conversation, and I found her depth of expertise in the industry invaluable. She gave me advice on how to make the most of my newly elected local GBTA chapter board membership with which she has extensive experience."